Click the above image to be taken to a site dedicated to Norfolk, Connecticut & come to know of the extent of evil some in this town known as "The Icebox of Connecticut" are capable of. Did Norfolk get that title due to frigid thermal temperatures or ...? Will it be Liberals who bring down humanity? Liberals are more likely than not, to save a tree, adopt a dog and/or cat, save the whales and so forth all the while walking right past humanity in need. They seem to have a numbness which allows them to PIMP "The Houseless" for their needs, yet fail to actually be real about helping those in need. The same needs they use to propaganda for profit/gain/control of their own - if honesty was put forth. Please don't hate these beings. Know that they suffer from Spiritual and/or mental CORRUPTNESS. Help them to know of their evil ways. Remember, they actually may be scared of being "The Houseless", so their actual actions dictate some of the misguided behavior. The Liberal infested town of Norfolk, Connecticut continues to work its magic, deception and/or wrongs masquerading as righteous acts. Now that the icebox is heating up, the snakes come to the surface. Mind you, there have been a few - counted on one hand - that do at least try to be clean, then there are the others. It's not just the so called "1%" that are of wrongs and for profit/gain/control! 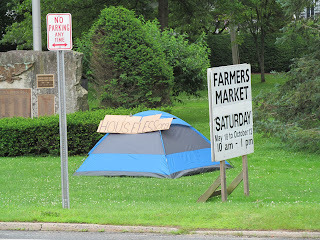 It appears that some, not all, of the so called "peace loving", Humanitarians of Norfolk, Connecticut work to keep the truth from you which is being shared via http://norfolk-now.houseless.net/ , but this is being worked on. So please check back for updates and more information to become AWARE! As always, DO NOT be as those, who for reasons they may, yet not limited to, suppress, use for profit/gain/control and/or be incapable of actually being real with other human(s) in need are about. "The Green" is the spot "The Houseless" was evicted to due to more Sinclair corruptness and involvement from "The Manor House". How long will it be before more evil falls upon "The Houseless"? With the placement of "The Houseless" abode, a screeching Liberal was quick to stop 2 ladies without want, thus spreading his confusion. One of the ladies wouldn't hear of his unwanted advances and shut his poisonous tongue off. Oh yes, there has been mention of the horrible grammar & spelling on a posting at http://norfolk-now.houseless.net/ and this has been noted! quess us down home "Houseless" just aren't worth a plumb nikel! LOL, OOPs more speeling ...! STOP PIMPING "The Houseless" for profit/gain/control and go actually live "Houseless" for a time, not just a night, then see if you concern so much about grammar ... .